Remember how my original cabinet design in the living room had standard 24-inch-deep base cabinets in the middle? So here are three different arrangements that I’m considering. I’ve got more floating around in my head, but these are the three main ones. First, the simple design. I like this one because it’s pretty uniform, and there’s nothing busy about it. I’m still contemplating bumping out the middle section about four inches or so, just because I have an idea for a way to conceal cords that will require a few inches behind the cabinets. So the two outer sections with the bookshelves will be 12 inches deep, and the middle section would be 16 inches deep. But as you can see, the countertop that goes all the way across will be at the same height on all three sections. I wasn’t planning on doing that (I thought I preferred the height variation just to add some interest), but the more I’ve thought about it, the more I think I like the uniform height. The second idea would definitely require more work on my part, but it adds more storage and makes some things a bit more functional. On the two outer sections, I would add a drawer. Then on top of the middle section, I would create open cubbies where game consoles, DVD players, etc., could be placed. I really do like variation, but my little condo may very well be too small for something with too much variation. It might be better to opt for version 1 or version 3 just to keep things visually uncluttered. One of my main concerns with Version 3 is that I’m afraid the extra cubbies will make the entire thing too high to put a t.v. on. 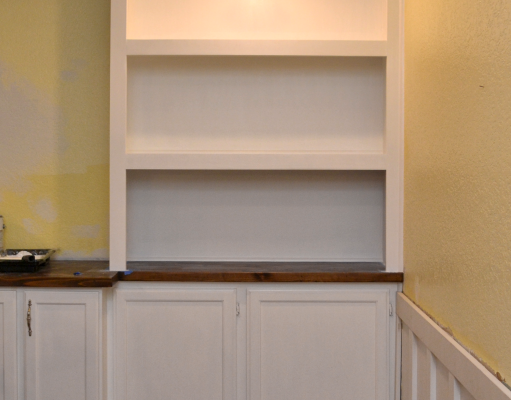 With the cubbies and the countertop, the finished height would be somewhere around 45 inches. But then again, there are plenty of people who place their t.v.’s above their fireplaces, so I’m really torn. To find out if #3 is too tall, you could mark it on the wall with tape or something. Just mark out a box the size of the TV at the right height. I think part of it depends on where you sit and how big your TV is as to whether it’s too tall. It does seem pretty high though. I agree! Option 3 is my top pick (if it isn’t too tall) and option 1 is my back-up. I also like #3 if it’s not too tall and #1 if it is. #2 is just too busy, especially for a small space. I can’t wait to see which one you pick! I like version #1 because it allows for the buyer to choose to stand a tv on the counter top or to hang the tv on the wall. The others, being so much higher (I know it’s not a lot, but it’s really is…) pretty much decides that the tv is higher, no matter what. Granted, a lot of people do like their televisions to be up high on a wall, but you’re removing your buyer’s choices with the second two options. Then again, it’s your house for now…where do YOU like your tv to be? I like the arrangement of #3. The addition of the drawers there in the middle breaks the simplicity of #1, just enough to add interest and definition between the shelving and lower cabinets. It’s subtle, but more pleasing to my eye. I agree with you on the simpler lines being better for your space. For my family, I would go with the 3rd option because I find drawers great for storing remotes, dvds, game controllers and games. We also use drawers in our dining room/office for laptop and phone charger storage. I can’t wait to see how it develops! I prefer #1 mostly because the book shelfs on either side are higher. At our house they made built ins on either side of our fireplace but made the book shelves too narrow so no books actually fit in there! (Pain!) #2 I find too busy and #3 is ok but I don’t think the drawers are necessary. If you want drawers just install them inside the cabinet like they do in some pantries! We have them like that all over the house and they add to your storage! I agree. I love my books and it is frustrating when shelving is too narrow to put my taller books on the shelf. Design #1 is simple and elegant. I think you should also consider those who will follow you into your cozy condo. The placement of the tv will be an issue for them as well as you, so design #3 just doesn’t seem to work. And design #2 just has too much going on for your small room. Simplicity is generally better all the way around. I love your ideas and really, any of them would work. 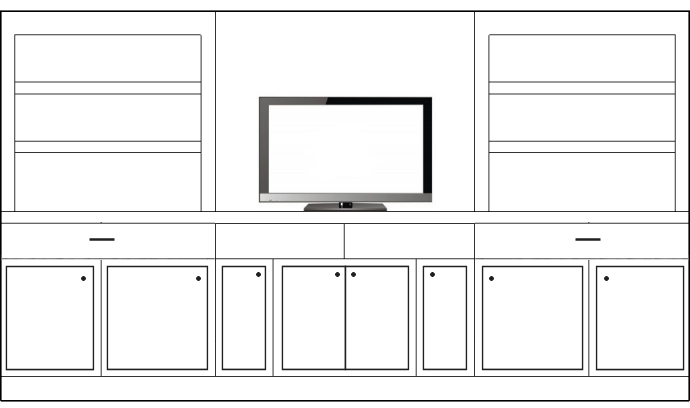 To save yourself some time though, why not do the ends like you show them in Option 1 and then, for the middle tv section, use the shorter (maybe I’m thinking wall cabinets?) and build 4 cubbies (or 2 cubbies and 2 drawers) on top to bring up to the same height as the cabinets on the ends? That way you get the component storage that you need, you still have the same height running the length of the piece, you’ll have visual interest instead of only all cabinets and you don’t have to go all crazy building if you’re putting it on the market? I like #1 for your space. I like the simplicity of it for a small condo. Remember you are getting this place ready to sell. This will be good practice for your future home. Save the elaborate time consuming projects for the future space that may be your forever home. Your buyer maybe a first time home owner who will be thrilled with any storage instead of a blank wall. Good luck with the room. I like #1 or #3. If it was me, I would go with #1, since it’s easier to construct. I think the only viable option is #1. It’s got a great clean look to is, with lots of functional storage/decorating space. If you’re concerned about locating the cable box etc, store it in the cabinet below and purchase an “eye” that you can mount on the TV and just wire down to the cable box, that way you don’t have to look at the clutter of any of the equipment. I agree with you about keeping it simple and going with 1 or 3. I like 3 the best because it gives you extra storage, and that’s ALWAYS a good thing! I love #3- drawers for storage in this area are awesome!! DVD’s, music CD’s, games & remotes… Our TV sits at 43″ and we love it!! Perfect height if you ask me!! You are so creative with everything you do! I like 3 the best because of the storage, but I like 1 also. The store bought 3 piece unit that I have looks like #3, and we love it. I love having that drawer space. I would go with design 1, design 2 is too busy and design 3 is nice but I think it ould give your space too much of a kitcheny look with the cabinets that have the drawer. Good Luck with whatever design you choose. My favorite is #3 and would do this one if it were a home that I planned on staying in for a great length of time. However, I would go with #1 if I were going to be selling it soon. My husband and I thought that we would be staying in our present home and had some grand renovation plans. Our plans have recently changed and now we find ourselves needing to put our house up for sale soon. We are finishing up the projects that we have started keeping in mind that we want to keep the cost and the time involved to a minimum. I agree, #2 is way to cluttered – I think #1 and #3 are better options for the space. My choice would probably be #1 since it will be easier and you’re selling shortly anyway. I would bump the center out and maybe add some storage cubbies or even doored (glass?) 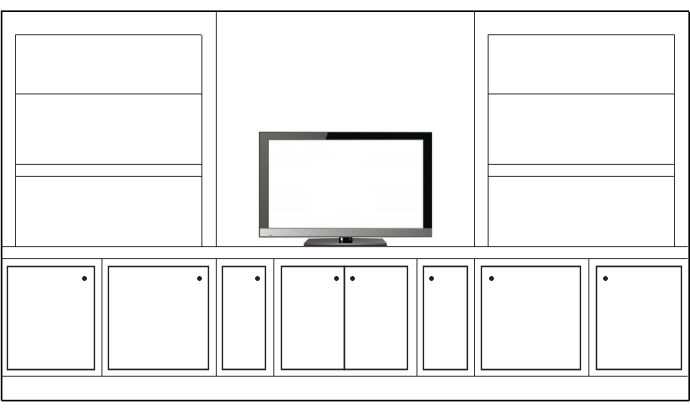 storage up above the TV, since there seems to be a lot of blank space that I’m not sure how you’d fill otherwise. Or maybe that gets too cluttered/complicated again with the bump out. I like # 3! The drawers at the top would be convenient, and the cubbies under the TV for the DVR or whatever. Whatever you choose will be great I am sure! #1. I like the idea of #3 but in reality, you are already putting in lots of extra storage for the next homeowner with this plan so I probably wouldn’t invest extra time for a few more drawers. Might as well save a little time and cost and go with #1 which is a great option. Number 1 DEFINITELY!!! Simpler is always better!!!!! It gives a defined place to put (at minimum) a DVD player for those people who do not subscribe to cable. For those of us that do, it provide us a place for our cable box. Plus the addition of space for an A/V receiver, game console, etc. In upgrading our electronics, we now have items behind doors, and while they may be glass doors, I find that I have to hit the sensor *just right* because of the doors. If you’re not leaving any openings behind the new built in shelves, then it has created an issue where a) cords are not hidden anyway because of electronics needing to be in open spaces and cords wrapping around to reach the TV and/or b) the inability to use said electronics without the doors open. #1 or #3. #2 is too busy. I like #1 & #3 both are great, I guess you have to decided how much work you want to do, since you said #3 will take more work. It will look great what ever you decide. I prefer #3, it’s more pleasing to the eye, and if you leave the spaces under where the TV goes open with spaces or holes for the cords to go through, it will be infinitely more useable for the inevitable entertainment system that will be there. i vote for #1. It’s great. It’s simple and I agree completely with Sharon B. Save some energy for YOUR new home. Whatever you do in your current space will be a total upgrade! I think #1. I have a similar set up in my living room. The cabinet on which the TV rests is 30 inches high. This is a great height to watch TV from a seated position. Anything very much higher requires the viewer to lift his head and in the long run will strain the neck. Especially since your husband has a disability, don’t raise the TV higher than the 36 inches it’s at already. I like #3 but since you are planning to move why add the extra expense of drawers. #1 is clean with lots of functional storage. I’d go with #1 since you are selling. but I would sacrifice for a fireplace. Whatever you do will look fabulous. Can’t wait to see your creativity. 3) it offers the best tv placement. 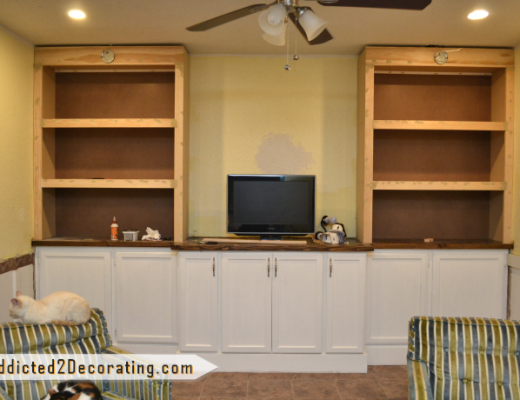 The only thing is component storage….would you consider leaving the door off of the center two cabinets or putting glass doors on those two? Or maybe just offering up the suggestion of removing the doors to potential buyers? I’m thinking out loud here…..:) Also, to get more of that enclosed storage that you wanting, I love the idea of using baskets in the open shelving. Hello! I really like #1. I agree with #3 looking too kitcheny. I’m sure whatever you decide….it will look amazing!! Number 1 – simplest and I think looks the best. HI. I am going to go against the popular trend and opt for version 2. Number 1 puts me in mind of office furniture. I take my hat off to you for even having a go. Cheers from slightly over cast Brisbane. Drawers are a pain. They break, things roll around too much, and so on. Create drawers AND add to your design just by using baskets on those empty shelves, or inside of the cabinets. 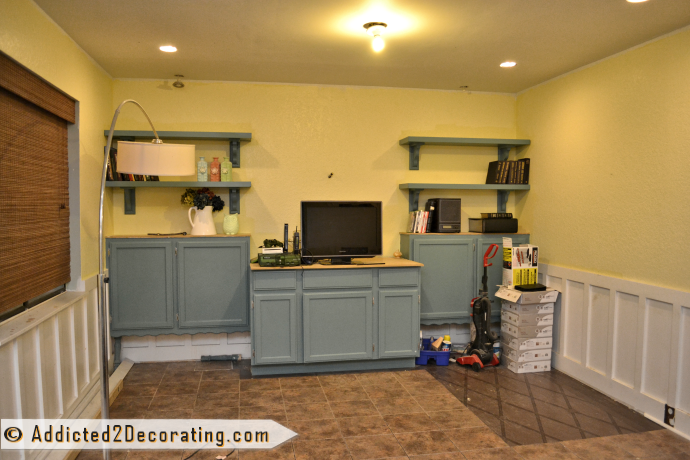 Try installing pull out shelves inside of the cabinets in #1. The drawers remind me of a display at an electronics store. #1. 2 is much too busy for a small space. 3 is OK, but I still prefer the simplicity of #1. #1 for nearly all of the reasons listed above. Whatever you do wiill look great. Just remember–you’re trying to SELL this place–don’t spend any more time/energy on it than you have to:-) Good luck! I like #1 the best, but I absolutely understand the need for more storage. Between the two more storage heavy options I like #3 a lot more than #2. #2 (as others have said) is a bit busy. I love the clean lines of the other options. I think it will allow the things on the shelves to pop without overwhelming everything else. I vote for #3. It’s very practical in providing more storage (never enough!) and the look is still streamlined and interesting. Don’t worry about the TV being too high, I think it’s actually perfect for viewing at this height. Of course, mine IS above my mantel at 60″ however, it’s in a very large room and still works well. You’re amazing Kristy and I greatly admire your talent and ambition:) You go girl!!!! I like number 3 the best because drawers are your friend. Number 2 drives me NUTS to even look at. Number 1 is nice but remember, in a small space drawers are your friend! I like #3-I don’t like the large blank space above the tv area in #1. #2 is too busy. First choice is number 3 and second choice is number 1. I’m not a fan of number 2. It must be my linear brain! #1 – I like the simplicity of it. I like #2 because it is a little different. But, I don’t like 4 doors of the center unit. I would like 2-3 doors, all the same size. 1 and 3 are basically the same and look like a line of stock cabinets. But, if you want a modern clean look, they fit the bill. 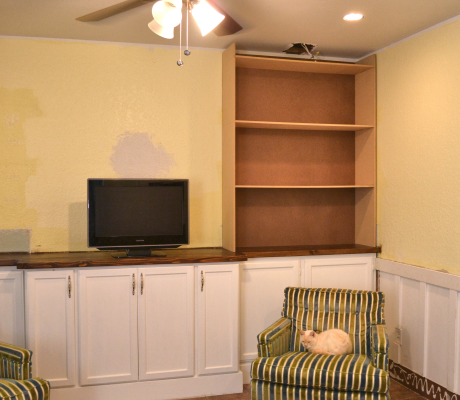 Have you thought of just having cabinets under the TV and floor to ceiling shelving on each side? I am a visual person and an artist. So I like to look at my stuff instead of hiding it behind a door. All those doors are over whelming to me. In some ways, all those doors remind me of a lawyer’s office. Personally, I have had all my TVs up high for almost 30 years. In my den the television is about 4 feet above the floor. It was wonderful when my children were small. They could play in the same room and not block the view of the TV. I feel like I am at the movies with my TV up high. I like #3 the best. Drawers would be so useful above the doors. You can put all the remote controls in there. We have 3 and we’re constantly losing them. From the illustrations, I’m a fan of both #1 and #3, but it might be if I saw #2 in real life I’d like it just as much. There’s just something about the placement of the cabinet doors that doesn’t jive for me with them not being lined up. Maybe if they weren’t the same height and they were out of line? Or if they weren’t lined up and the shelf in the middle also dipped down lower to mirror it? Anyway, I vote for anything but #2 for the moment. I like number 1- it’s simple beautiful, the right height for the TV, anything too much higher and you’d be straining your neck looking up—-baskets could be used for controls, etc….as far as the blank space above the TV a shelf could be added so it doesn’t look so bare..I like number 3 as well, just concerned about the height of the counter..either is going to be fantastic…I think as a lot of others number 2 it just too busy for a small space…..Either 1 or 3 will be gorgeous…keep up the good work…so enjoy your blog.. I like number 1 the best but since you’re selling the condo, I’d say that either # 1 or 3 would have the biggest impact for resale. The second one might be a bit too busy with the varied heights. I like the lines on versions 1 and 3 best. I like the idea of bumping the middle section out by just a couple of inches too, it will add interest without visual clutter. Can’t wait to see the finished piece! I vote for #1 for the same reason you mentioned–I think it might overpower your small space. I’m amazed that I actually have an opinion, but I do! I vote #1. Clean, simple, and functional and probably best for selling your home. #1 is my favorite. I like the simple style. #2 and #3 looks too busy in my opinion. I like the third one the best. I like the television being at a higher height, seems to balance everything out more. And I also like the drawers being up higher, seems like at that height they would be more accessible for your use…especially for your husband. It’s going to look great! #1, sleek and simple looking. It would be more appealing to the individual person. I agree with ECKDesign. I like #1 and was also thinking you should just drill a hole for the cable wires rather than bump out the cabinets. I love the blue color of the cabinets you have now. Are you planning to keep the same color? I like # 1 or #3, your right #2 makes it too busy for the condo. I would prefer a sort of mirror of the other side – although in white cabinets like you said. I also think putting the TV on the wall, instead of sitting on that middle cabinet would look better. I really like #3 best. My actual fav was #2, but since your condo is small, I think you’re right that it might be too busy. #3 looks the cleanest and you get extra storage with the drawers. I like #1. It is not too busy looking for a small space. It has very clean lines. Hi, I would choose #1 for it’s clean uncluttered facade, especially for a smaller space. I’ve seen drawers that roll out from under base cabinets that were made as a step, but it could be a narrow drawer for cd’s and not add extra height for the tv, they would be cut into the base, add drawer glides and you have it! Nice job selecting drawer sizes. My pick would be #3. The height is not a concern really, #2 height seems to be the same. I feel the in the long run that #3 seems to make the most practical use for a tv center. You have your cubbies, and drawers for misc. The uniform width of 12″ makes it look less like kitchen cabinet. The orginal pieces did look just like kitchen cabinet. Love what you do, keep up the great job!!! Looks like nobody is a real fan of #2. #1 or 3 or good, whichever works best. However, since you are doing this with a sale in mind, why not opt for #1 for the simplicity and cost effectiveness. You do beautiful work so I’m sure either way will be fab. Sorry for the typo! I meant *is good, not or good in the first sentence. Hmmm. I really like the idea of having drawers (and personally I would have the drawers on top of the cabinets instead of down below), but at the same time I am kind of worried about the TV being to high too. We were going to mount our TV but after being at a friends house we realized that we didn’t like the TV being up so high, it was just uncomfortable. Would it be possible to have the drawers on either side without lifting the middle section where the TV would go?